An outstanding solid oak arts and crafts bed. 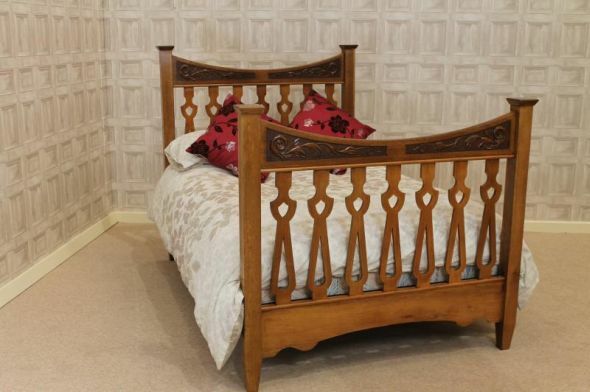 This is probably one of the best examples of an arts and crafts double bed that we have ever had in stock. It has recently been acquired from a large house within the Staffordshire moorlands. The bed is in excellent condition for its age and comes complete with a newly made pine bed base. As shown in our photos, there has been a small amount of old woodworm in one corner of one of the bed ends. This does not affect the bed at all. As this bed is over one hundred years old, you must appreciate that there will be a small amount of wear and tear. The bed is on display in our showroom, and you are more than welcome to come and view it.